More than a few Android fans are ready and willing to get their smartwatch on with the new Android Wear platform, so some German users must have been excited to see LG's G Watch pop up in the Play Store in Germany. AndroidPit spotted a small section of promo text for the device, and while it didn't include any photos or links and it was quickly removed, it certainly implies that the G Watch will be sold on the Play Store. In Germany. The G Watch never sleeps. The constantly activated display shows you at any time to time, and new information, without you having to touch it. 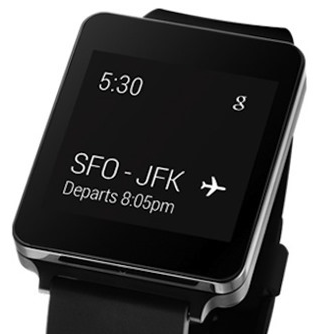 We already knew that the G Watch will probably make a debut at Google I/O, and presumably it will be available for purchase soon after (though with Google and the Play Store, international availability is always a bit tentative). We can hope that this premature spot on the German Play Store means that Google is preparing promo pages for the G Watch, if not actually preparing to sell it. So far we've heard considerably less about Motorola's Android Wear device, the Moto 360, though it has made a few public appearances.